Where can I view my credit card transactions? Get an itemized list of all of your credit card transactions and processing fees in your My Money section. 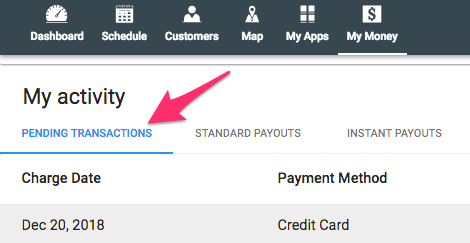 To view your credit card transactions click on the My Money section at the top of your dashboard. Transactions that have not yet deposited will be in your PENDING TRANSACTIONS section. 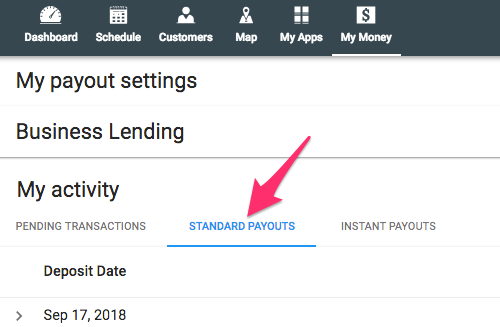 To see past transactions, select the processing method you are using (Standard Payouts or Instant Payouts). Then click the > icon. This will then expand to show you all of the credit card transactions included in that deposit, along with the charge dates, processing fees, invoice numbers and customer names. 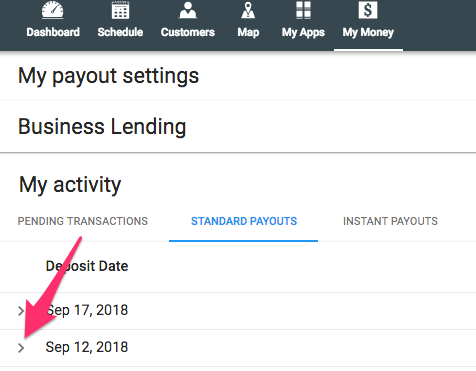 For Standard Payouts, credit cards transactions will show one business day before they will be deposited. It will say "In_Transit" under Payment Status. Important Note: Bank holidays and weekends are not considered business days and will delay standard credit card deposits.